On the 19th June 1997, Nic and I returned from a three week surf trip to the Maldives. On the 2oth of June we started a business in the front room of my house and didn’t surface again for the next year! Our first Xerox printer, the mighty “Empress”, was capable of print speeds of around 4 pages per minute (ag shame). After six months of eighteen hour days, working in shifts on our shared computer, finishing and delivering all the printing ourselves, we started to make headway and hired our first designer. We’ve come along way since then. Seventeen staff members and print speeds of up to 100 pgs per minute, loads of life lessons learned along the way! It feels very grown up to say we are eighteen years old, and we definitely do things differently today than we did eighteen years ago, but certain things have remained the same – we still need good people in order to provide good service. 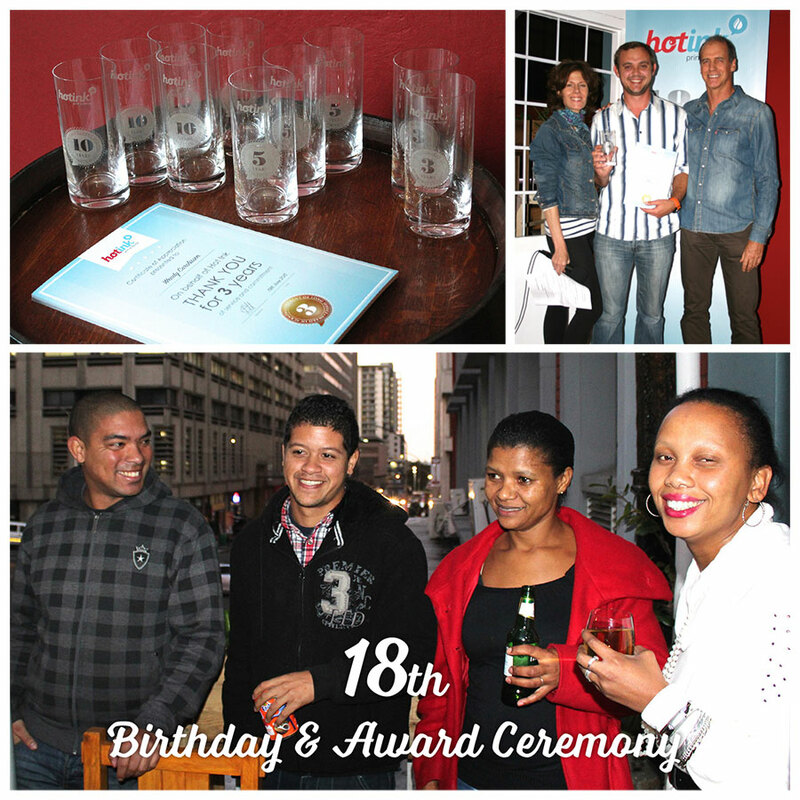 To celebrate our 18th Birthday (see our party pics), we decided to honour the good people who work for us and to show recognition for those who embody the spirit of Hot Ink by going beyond the expected norm on a daily basis. Amongst other awards, we handed out no less than five ‘Long Service Awards’ for people with ten years or more at Hot Ink – surely we must be doing something right?! We had a fantastic evening at Loaves on Long and were reminded how important it is to show gratitude to people who work hard and not to expect that merely offering employment is a reward in itself. As we start our next eighteen year cycle amidst tough competition, we will continue to adapt to the ever changing digital world we work in by making use of the best technology available. However, one thing will remain the same: we will always strive to provide excellent, people-based service that our clients can still relate to as human beings.